Fish and chips are a national favourite, and there’s a fish and chip shop on most high streets. But this meal is another one that has a reputation for being greasy and bad for you, so what’s the truth about the chip shop fayre that we all love? 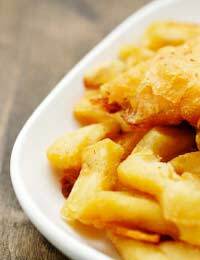 If you choose the right foods on a fish and chip shop menu, you can end up with a reasonably nutritious meal, even if it’s high in calories and fat. The balance of protein, carbohydrate and vitamins in fish and chips even kept the Territorial Army well fed as they prepared for battle in special training camps in the 1930s. Many health experts have said that we should try to eat more fish, because not only is it healthy, low in fat, high in protein and a good source of omega 3 fatty acids, but research has shown that eating fish regularly, for example once or twice a week, may actually help reduce the risk of some diseases. Add some baked beans or mushy peas to your meal, and you’ll also add some helpful fibre and vitamins to your selection. How Much Fat Is In A Fish Fry Up? An average portion of battered fish and chips contains quite a hefty 20.6g of fat – although it won’t all be the saturated kind. Most fish and chip shops use the healthy rapeseed oil option, or other vegetable based frying oils to fry in rather than the bad for you animal based lards of yesteryear. The fat content is still around almost three times less fat than a chicken tikka masala and pilau rice, or Chinese sweet and sour pork with egg-fried rice. Some of the other items on a Fish and Chip shop menu aren’t as nutritious and healthy as the humble fish and chips. For example, a battered sausage may seem like a good idea at the time, but the sausages you’ll find in a chip shop aren’t likely to be of the highest quality. They are also, obviously, covered in high fat batter and don’t offer the same type of nutritional benefit as fish. For around 750 calories a portion, you might want something a bit more healthy! You also need to be aware of the nutrition in fish and chip shop pies too. While a pie can be a reasonably nutritious option, depending on the filling and type of pastry, some fish and chip shops use cheaper pies that are likely to use lower quality ingredients. Pies are also generally high in calories and fat, although they do provide protein from the meat based fillings. Overall, if you’re going to opt for a take away, a fish and chip shop dinner isn’t a bad choice. The menu options that you’ll find in most chippies are varied; offer a good selection of less unhealthy options, and good old fish and chips is also one of the least processed fast food meals you could opt for. So enjoy! Really good chippies are starting to offer even healthier options, like cooked salmon - not in batter. Even if you buy fish and chips, opting for a smaller serving on both cuts down on the calories and fat, especially with the chips. For most people it will certainly be enough, and it'll cut down on food wastage and also cost. In this age where so many are obese there's no need to supersize it.